Adam Aaronson has been at the heart of British studio glass for nearly 40 years, first running galleries dedicated to glass art and subsequently as a glass artist in his own right, learning how to create glass art later in his career and developing self-taught methods. Adam is a skilled maker and a truly diverse and talented glass artist. He is constantly experimenting with techniques and exploring new ideas, including the potential of large sculptural works designed for the outdoors. Adam’s fascination with glass started when as a small boy he used his pocket money to buy a coloured glass vase as a present for his mother. Later, at school, he was drawn to clay, captivated by the ability to create three-dimensional forms and encouraged by his teacher, Gordon Baldwin, the legendary ceramicist. Despite his early interest in the arts, Adam initially planned a more conventional career and graduated from Keele University with a BA Hons in International Relations. After university, while considering his next steps, Adam whiled away a summer working at his family’s London gallery, which specialised in antique furniture, glass and porcelain. A chance invitation from glass artist Peter Layton, now one of the “Grand Old Men” of British art glass, to join one of his first weekend glass courses in 1977 proved the catalyst, confirming his fascination with glass and cementing the career direction Adam would take in the future. In the first few years of his career in glass, Adam worked with his family in Highgate, north London, to develop their business, called Coleridge, into the UK’s first gallery devoted entirely to British Studio Glass. Another, more central, gallery followed in 1983 in London’s Piccadilly, and this became a top destination for glass lovers and collectors from home and abroad. Coleridge was a launch pad for a number of emerging glass artists who went on to forge international careers, including Margaret Alston, Tessa Clegg, Anna Dickinson, Alison Kinnaird, David Reekie, Colin Reid, among others. Then, in 1986, Adam decided he wanted to make the transition from selling glass art to making it, and he opened his first glassblowing studio, in Clerkenwell, London. 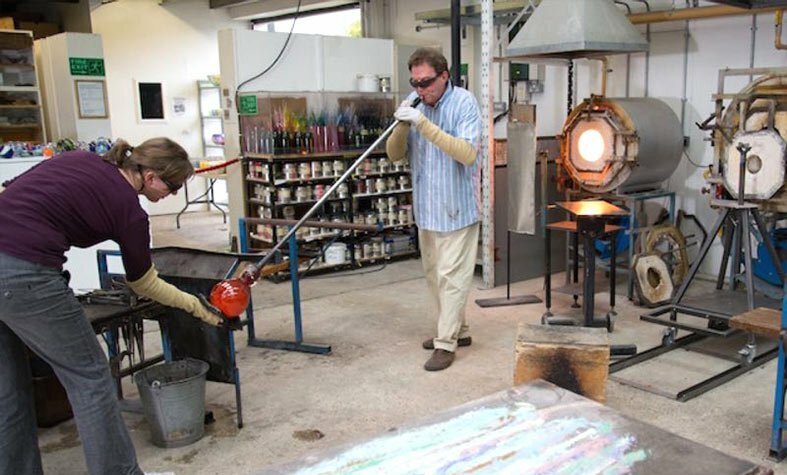 This studio marked the beginning of his personal journey as a glass artist, as well as offering both British and international artists the chance to develop their own work through residencies. As the years rolled by, Adam moved his studio several times before settling in to premises in London’s Earl’s Court, where he was to spend nearly 20 years. Here Adam developed his talent and skills, and opened his on-site gallery, Zest, with the dual goal of showcasing his own creative output while continuing his quest to bring outstanding British glass to a wider audience. 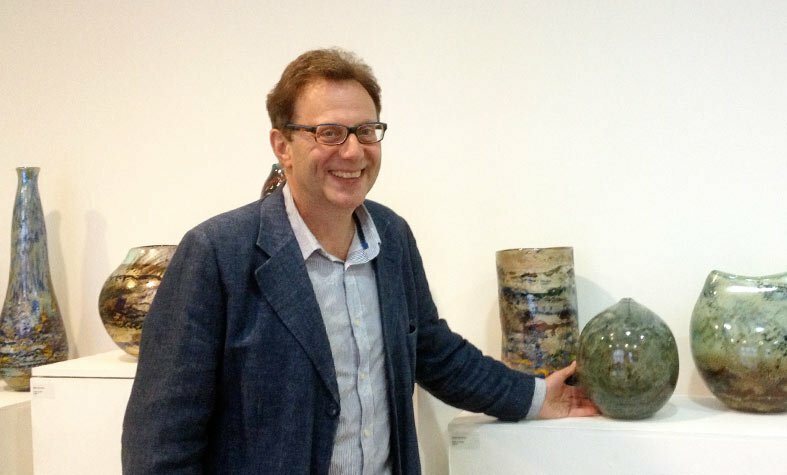 For many years, Zest was one of the few galleries in London devoted entirely to selling and exhibiting Studio Glass art and Zest also exhibited at international Art Fairs, including Art London, SOFA New York and Chicago, showing Adam’s work together with numerous British artists including Vic Bamforth, Max Jacquard, Alison Kinnaird, Peter Layton and Naoko Sato. During this period, Adam initially focused on selling his work through up-market retailers such as The Conran Shop, Liberty and Harrods as well as galleries and museum shops all over the world. These included The Guggenheim and The Museum of Art and Design in New York City. He travelled to New York, San Francisco and Paris several times a year to attend trade shows, where he sold his work to galleries across the United States and Europe. With this exposure, Adam found himself increasingly sought out by interior designers to commission bespoke solutions for both domestic and commercial projects. Finding that he enjoyed this creative collaboration with interior designers and architects interesting and challenging, Adam’s focus shifted away from trade shows to concentrate on working to commission, as well as making more time to develop his own artwork. Notable commissions included a glass and steel four-poster bed in an Oxfordshire home, a seven-storey glass staircase balustrade for an Alpine ski chalet, a large wall sculpture for a boutique hotel in the Cotswolds and numerous lighting and interior accessory projects for top London hotels and restaurants. More recently, he was commissioned to make several glass fountains for the gardens of a private home in the South of France. In 2012, when Adam found out that property developers had decided to knock down the building that had been his London studio for so long, he decided to turn a disaster into a virtue and escape the capital for a peaceful country location. After a long and difficult search, Adam found the perfect spot – an old agricultural building in West Horsley, a small village near Guildford in rural Surrey, 30 miles southwest of the capital. He moved there in the spring of 2013. Adam soon found inspiration from his new surroundings in the rolling countryside of the Surrey Hills Area of Outstanding Natural Beauty and a new body of work began to take shape. 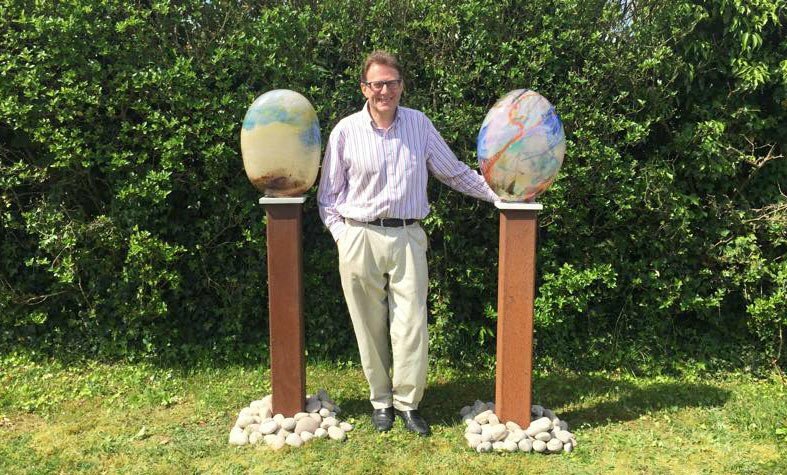 The scale of Adam’s work grew larger, and he began to develop a series of sculptures for outdoor settings as well as water features alongside the work for which he is already well known. In Surrey, Adam threw himself into the local arts scene and has become firmly established. He takes part in the annual Surrey Artists Open Studios event and was nominated in 2014 for Surrey Artist of the Year. As his reputation spread in Surrey, Adam knew he had arrived when he was asked to award a prize at the village flower show! And Guildford Borough Council invited him to participate in the annual Guildford Heritage week of events. A visit to his studio reveals the great variety of the work produced. The glass produced consists of one-off artworks, such as those in his “Imaginary Landscape”, “Strata” and “Cloud Garden” series, commissions for individuals, and trade orders where a range of work is produced and repeated for sale to galleries and museum shops. Adam also spends most weekends teaching his popular half-day courses, Introduction to Glassblowing for Beginners.